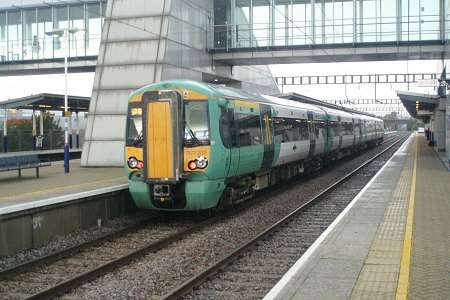 In preparation of receipt of their 23 new class 377/5 units between November 2008 and March 2009, mostly for use on Bedford - Brighton services, since May 20th have been borrowing 's 377202 for testing purposes. Curently the track access agreement allows for two ad-hoc diagrams to be inserted between existing diagrams 09:00-15:00 SX. That unit is seen here at a very wet Luton Airport Parkway on 4th September.